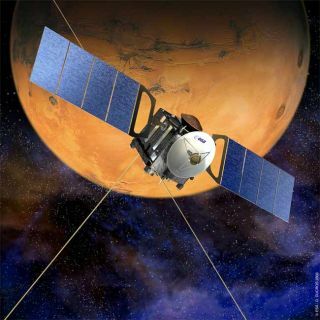 The Mars Express spacecraft (shown here in an artist's impression) of ESA confirmed the presence of methane on Mars. TheEuropean Space Agency (ESA) on Tuesday announced mission extensions for threespacecraft currently exploring Mars, Venus and the Earth?s magnet field. Theextensions will allow Europe?scurrent Mars Express and Venus Express probes to continue their missions at theirrespective planets through Dec. 31, while ESA?s Cluster spacecraft willcontinue to do the same at Earth. Theannouncement marks the third extension for Mars Express, which launchedtoward the red planet in 2003 and ended its initial mission in October 2005.The boxy Mars Express is Europe?s first mission to Mars and carries seveninstruments, including a ground-penetrating radar that has probed beneath theMartian surface to discover pockets of buried water-ice. MarsExpress was the first spacecraft to detect the presence of methane in theMartian atmosphere directly from orbit, and has beamed home stunningthree-dimensional views of the planet?s surface, as well as mineralogicalevidence for the presence of liquid water in the planet?s history. Thespacecraft has also taken close looks at Phobos, one of the two moons of Mars. Launched inNovember 2005, ESA?s Venus Express has beencircling the cloud-covered planet Venus since it arrived in orbit around theplanet in April 2006. Thespacecraft found definitive proof of lightning in the Venusian atmosphere,which it has been mapping with unprecedented detail, and tracked water molecules escapinginto space from the planet. Venus Express has also used infraredinstruments to study the planet?s cloud-covered surface and discovered an odddouble vortex churning above the Venusian south pole. The VenusExpress mission was extended once before, to May 2009, and will now get anextra seven months to study the second planet from the sun. ESA officials saidthe extra time will allow scientists to continue their hunt for active volcanoeson Venus and better understand the planet?s harsh climate. Cluster,the third mission extended by ESA, is actually a constellation of fourspacecraft launched in 2000 to study the Earth?sprotective magnetic field. The mission generated the firstthree-dimensional views of the magnetic field lines reconnecting in space, aphenomenon that releases immense amounts of energy. The Clustermission was extended twice before, most recently through June 2009. The newextension will allow scientists to use the spacecraft constellation to scan theauroral regions above Earth?s poles and take an in-depth look at the innerregion of the planet?s magnetic field, ESA officials said.